Well, the party may be over at Peachy Keen Stamps, but the sale is just getting started! The Release party was wonderful - filled with fun, games and some amazing inspiration by the Design Team. After the party, Kathy posted the entire March, 2013 Release and threw in some awesome SALE prices! You can see the Release and all the details about the sale here. You also have time to play along with a couple of fun challenges that will be going on until Sunday, March 10th at midnight. The first challenge is hosted by our very own Jeanne Streiff, and Jeanne's challenge is all about embossing! 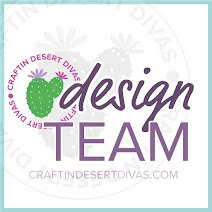 Click here to read all the details about this challenge and to see the wonderful inspiration created by the Design Team. 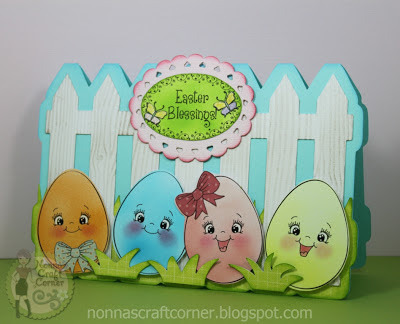 * I started with the picket fence that I purchased from the Silhouette Online Store. I used the "Offset" feature to create my card base from the blue cardstock. Next, I cut out the fence 2 times. 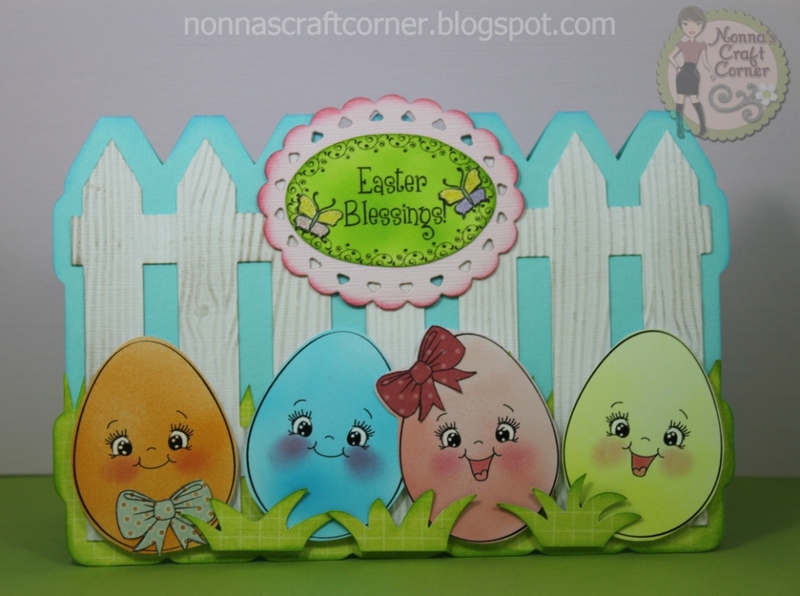 * I glued the fence layers together and embossed them with a woodgrain embossing folder. 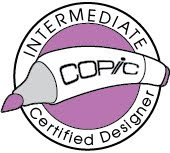 I inked up the embossed areas with a light gray ink. *Using the new Peachy Keen Stamps set PKSC-15, I stamped these cute little eggs and fun faces. * I got out my new toy and had a blast air brushing these little cuties! Talk about fun! Oh my gosh, I had them completely covered in seconds and I love the shading! I used a lighter shade of Copic Marker for the top portion of each egg and a slightly darker color for the lower portion. * I paper pieced the bows and added them to the eggs, used my white gel pen for the eyes and added some rosy cheeks. * Next, I used some pop dots to position my eggs in front of the fence. I cut a few little tuffs of grass (from the SOS) and popped them up in front of the eggs. 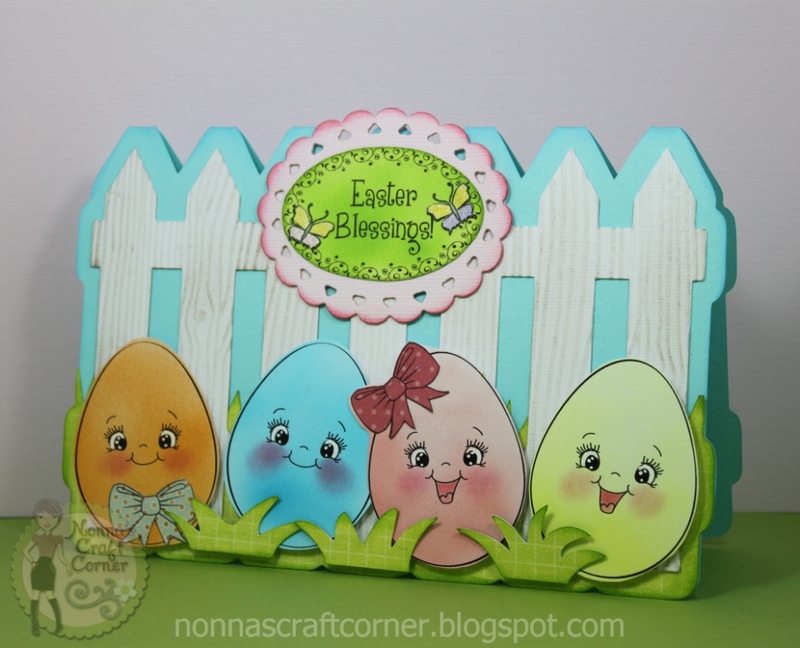 * The "Easter Blessings" sign is also air brushed and matted onto pink cardstock cut with the Spellbinders die, "Beaded Ovals". * Those darling little butterflies are also from the new March Release (PKSC-15). I colored them with my Copics, cut them out and glued them into place. I thought they needed a bit of sparkle, so I used a Atyou pen in "Clear" which added just the right amount of sparkle. Cute, cute, cute!! Oh my goodness they're cute. Wow, you've done well with your new toy! Enjoy!! Tanya that is such and adorable card! Love love those faces!!! so cute!! this just LOOKS like it was so much fun to make! They are adorable! Awwwww!!! I LOVE this!!! Such adorable new stamps!!! LOL...TOO CUTE! !I love your Easter EGGS! Love their Stinkin cute faces.AWESOME!!! FANTASTIC card! OMG, I just love the eggs...they totally crack me up with those faces! I love the fence too...so adorable! Tanya ~ Oh my this is so ADORABLE!!! I just LVOE the shape of the card and your eggs! The details are simply PERFECT! Those eggs look GORGEOUS! Okay I am for sure moving in! I require very little room on the craftroom floor to sleep and I clean a bathroom like a mad woman! LOL! Perfect for Easter. Love the shape! That air brush sounds like fun!! i love the result on these eggs! Too cute! Fabulous card,you had me at the fence!! Lol! Love your airbrushing..it looks really good. 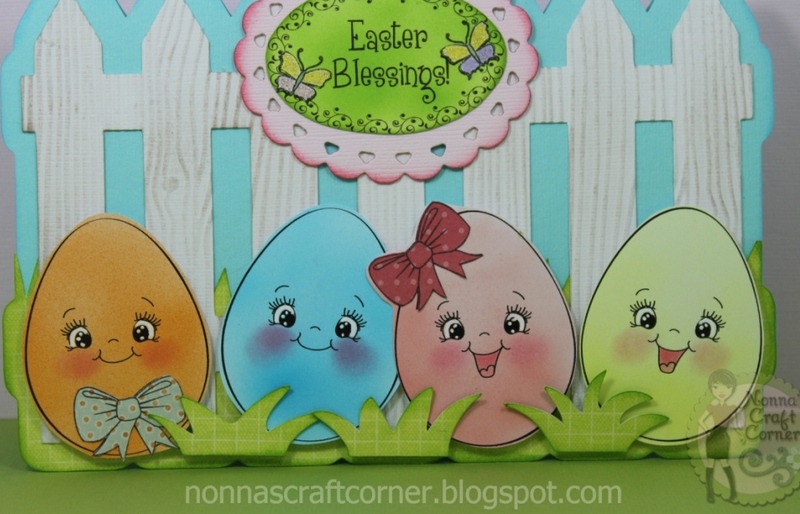 This is so bright and cheerful and just screams Easter with those fabulous colours! The airbrushing looks super. How fun to have a new toy! Egg Noggins!!!! SO CUTE! You will have to see my comment on the cute little bunny card for this to make since, but thanks for the memories! So Cute!!! This just makes me so Cheerful !! Love the bright fun colors and of course your little scene you made is fabulous !! Just soooo darling and seeing the airbrush being used. I need to go see another You Tube to see what I need.